The Mirrored City is full of conquerors, despoilers and seekers of arcane knowledge, but Mollog � an ancient Dankhold Troggoth � just wants a nap! Stirred from a long slumber, he now seeks a bit of peace and quiet, and is more than happy to crack the skulls of anyone who�d deny it to him. 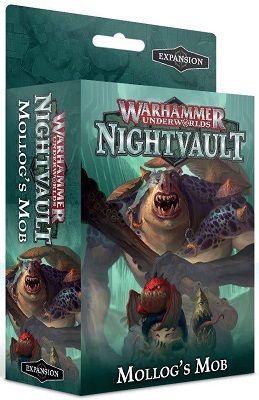 Mollog�s Mob is a Warhammer Underworlds warband like no other, focused around a single, brutally powerful fighter (and his squiggy mates). You�ll sweep through unprepared warbands with ease, using a host of nasty critters to support your rampage. 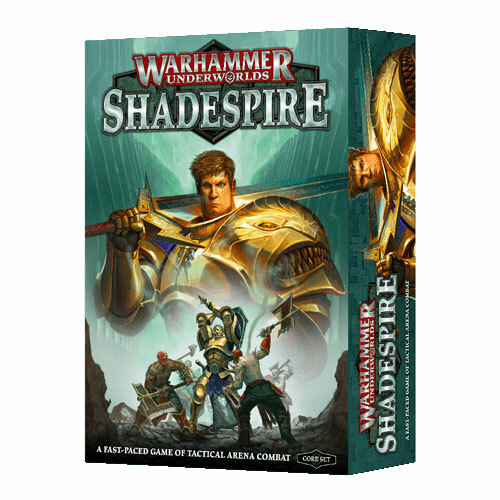 Inside this set, you�ll find four push fit models that let you build Mollog�s Mob, plus fighter cards for keeping track of their rules in battle. This set also features 60 unique cards, available only in this set. You�ll be able to harness the full might of Mollog�s Mob with 29 warband-specific cards, or upgrade your decks for any warband with 31 universal cards � including objectives, ploys and upgrades � that anyone can use. Once you've conquered the Mirrored City, you can move on to the Mortal Realms and use Mollog as a Hero in your Gloomspite Gitz army with a free warscroll � find it in the Downloads tab.